The 1950s was known as the “golden age” of America. The United States had just come out of World War II with a victory. The economy was the highest it had been in years, and the birthrate was at an all time high. After the war, Americans were ready to enter a new age of “opportunity and futurism.” The American Dream was centered on family and prosperity. The number of homes being purchased quickly grew with couples ready to start a family. Americans were looking to pursue dreams of prosperity. This was very possible with the great climb of the economy. Post-war America had left the economy at an all time high since the Great Depression. During the war, more women had been working to make up for the absence of the men. After the war ended, many women did not back down. According to the Bureau of Labor Statics, by then end of the ‘50s, nearly 35% of women were working, many of them being wives and mothers. Between the years 1951 and 1957, with the exception of 1954, unemployment rate stayed under 5%. Overall, the ‘50s had seen an increase in the economy by 37%. This increase was largely due to rise of consumerism. From the end of the depression up until the end of the war, American advertising and consumerism had dwindled. Americans were more cautious about saving and reusing. 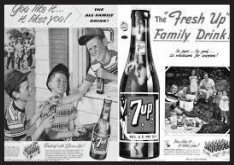 With post-war despair, advertisements focused on the image and values of family. Products and services were incorporated in ads of fathers, sons, mothers and daughters enjoying family outings or the leisure of their own homes. 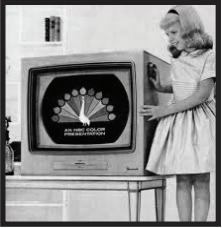 Due to the baby boom, children were centered in many of the ads. The economy was not the only thing developing during the ‘50s. The Civil Rights Movement saw many positive changes. For instance, the famous Brown vs. Board of Education trial was held in 1954. It was in this case that the Supreme Court ruled “separate but equal” schools were in-fact unequal, therefore unconstitutional. This was a big step towards civil rights and equal opportunities for African Americans. In 1954 Rosa Parks was arrested for refusing to move to the back of the bus. Her arrest inspired Martin Luther King Jr. to lead a boycott, resulting in bus companies desegregating their busses. This boycott marked the first steps to the beginning of the Civil Rights Movement. On Sept. 9, 1957 President Dwight D. Eisenhower signed the Civil Rights Act of 1957 into law. One of the biggest outcomes of this act for African Americans was the establishment of their voting rights. The act made it illegal for someone to deny another person, despite his or her race, the right to vote. 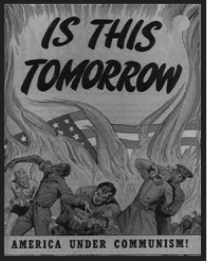 Americans were not the only ones threatened by the rise of communism. The Soviet Union felt that communism anywhere outside of their country would threaten democracy and capitalism. This tension led to a war that would last for decades, one of the longest lasting wars in American history. Millions of lives were lost during the time, as well as billions of dollars. Americans and the Soviets were in a race to be the first to successfully launch and orbit a satellite into space. On Oct. 4, 1957, the Soviet Union launched the satellite named Sputnik, meaning “traveler.” Sputnik would be known as the first man-made object to orbit the Earth. This came as an unpleasant surprise to the U.S., but only sparked American scientists to step up their game. 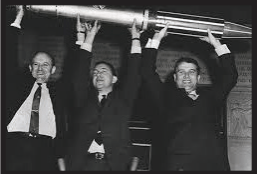 On Jan. 31, 1958, the U.S. military launched Explorer 1. The satellite orbited the earth for almost three months ending on May 23, 1958 until returning to Earth less than a year later. In the same year that Explorer 1 was successfully launched, President Eisenhower signed NASA into motion. The development of the National Aeronautics and Space Administration was dedicated to furthering space exploration. This proved effective when later that year the “Mercury Project” was started. The project was designed to take the first Americans to space. One year later, in 1959, the U.S. successfully launched and returned two monkeys from space. Along with these developments in science, the ‘50s was also a decade for advancements in technology and medicine. 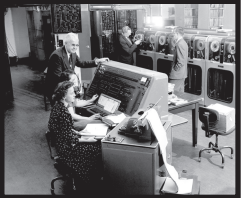 In 1951 the first commercial computer was invented, known as the Universal Atomic Computer, or UNIVAC. Its inventors were J. Presper Eckert and John Mauchly. The computer was capable of computing both numbers and letters. It was famous for successfully predicting the outcome of the presidential election in 1952. In 1955 Dr. Jonas Salk developed a vaccine for polio, known as the Salk vaccine. Later in 1959, Albert Sabin developed an improved vaccine, which had longer lasting immunity than the original Salk vaccine. Also in 1959, Johns Hopps invented the first heart pacemaker. It was designed to electrically start a heart that had stopped beating. This invention was a huge step towards internal pacemakers and eventually artificial arts. In 1950, Frank McNamara introduced the first credit card, known as the Diner’s Club Card. According to the card’s website, he came up with the idea after facing the horrible embarrassment of leaving his wallet at home, resulting in his wife paying for dinner. I’m not sure whether to thank or hate McNamara for his invention. Private debt in the United States increased by 151.2% throughout the ‘50s. While this seems like a disastrous outcome, during the ‘50s this rise of debt fueled the economy even more. The ‘50s, without a doubt, was a decade of citizens living the “American Dream.” Even with its hard times, it was a period for opportunity and prosperity. The numbers used in this article were obtained from articles on Adage.com, history.com, the NASA website and the Bureau of Labor Statistics. The Great White North in A Weekend: Seton Hill Student-Athletes Experience Different Cultures, Eh?